The 370Zs six speed transmission has beefy gears, shafts and shift forks for strength and durability. Nissan has done internal mods to the shift mechanism for smoother easier shifting. The most notable thing about the 6-speed manual transmission is the very unique, revolutionary feature called synchrorev. Syncrorev harnesses the abilities of the engine's drive-by-wire throttle to automatically rev match the downshifts much like heel-and-toe shifting. Heel-and-toe is a skill that takes awhile for most people to master and is important for track and brisk driving. In heel-and-toe downsihifting, the throttle is blipped with the heel or side of the foot when braking for a turn during downshifting. The blip helps the engine match the revs of the next lower gear. This prevents what drifters call shift lock, when the engines braking force after a downshift upsets the balance of the car causing oversteer. Heel-and-toe also puts less stress on the engine and drivetrain when downshifting. 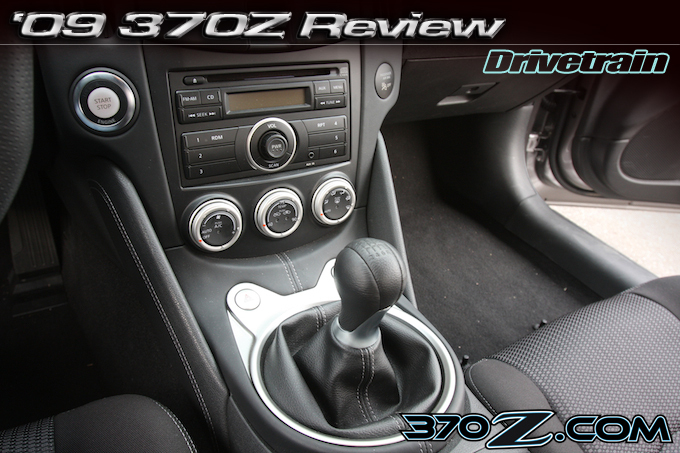 The 370Zs six-speed manual transmission's shifter has an ergonomic shape to aid cross-gear shifting. Syncrorev simply automatically takes over the task of rev-matching while downshifting automatically. No longer will you have to practice for hours to rev-match smoothly. Hit a switch and the 370Z takes over like having an onboard professional racer doing your downshifting! If you don't want this feature active, like perhaps you are drifting and you want to shift lock to help initiate a drift, you have the option of switching syncrorev off. Syncrorev is a tremendous assist to those who drive briskly, do track days or autocross. Heck, it is also nice for those of us who just want to drive smoothly. A heavy 30 lb dual mass flywheel is used to reduce NVH--this is good for smooth and quiet driving, but you can feel the flywheels mass. The lightweight flywheels made for the 350Z are probably direct bolt-ins but how will the light quick revving flywheels affect the computer controlled syncrorev feature? Time will tell. The 370Zs dual mass flywheel was designed to damp out unwanted noise and vibrations. It is very heavy at over 30 lbs which slows throttle response and acceleration. Companies like Jim Wolf Technology make lightweight flywheels which greatly help acceleration but the question is, will a lightweight flywheel mess up the Syncrorev feature of the transmission?